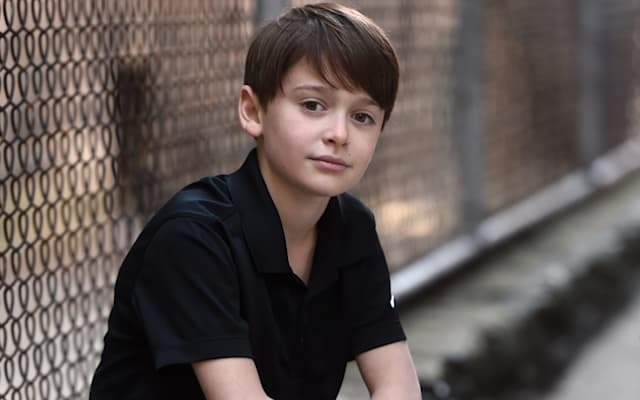 Don't let Noah Schnapp's age fool you. The 11-year-old actor is making his big-screen debut next week in the upcoming Cold War thriller "Bridge of Spies," which was written by the Coen brothers, directed by Steven Spielberg and stars Tom Hanks in the lead role -- and it's already getting a ton of Oscar buzz. It's not hard to see how Noah, who speaks with eloquence that suggests maturity beyond just 11 years of age, clinched the role of Hanks' son despite having little professional acting experience. In addition to learning a lot about the Cold War, which he hasn't studied yet in school, Noah learned and absorbed some major takeaways from working with Hollywood heavyweights while filming "Bridge of Spies." "It was such an honor working with Tom Hanks because he's such a selfless actor. He would always let everyone else shine, and I also learned that you don't always have to stick to the script. You can improvise a lot," he told AOL in an exclusive interview. "Working with Mr. Spielberg also was just such an amazing experience and he helped me a lot. He was always jumping in helping me." It can be tough being among the youngest on set, but Noah, along with his two on-screen siblings, were well taken care of, according to his real-life dad, Mitchell, who admitted to being "overwhelmed" and "in tears" when he received the email that his son had gotten the part while he was away at summer camp. "That's where Tom Hanks really shines," the elder Schnapp said. "He literally made it like they are a family unit and oftentimes behind the camera, they are singing songs, holding hands ... He has a way of making everyone feel comfortable." Working with his on-screen father had an impact on the young actor, whose decades-long career Noah said he'd love to emulate (in addition to his "smart and generous" idol, Robert Redford, who he met at Sundance last year). "He's just so well-known, and everyone knows him as such a great guy. I just want to be an actor who everyone knows as such a great guy and so selfless and a great actor," he said. Noah is well on his way to becoming a household name. He began acting when he was 6 years old. Two years later, his acting teacher suggested he pursue a professional career, and Noah welcome the idea, thinking, "Wow, that'd be so amazing if I could do that every day." Though he hasn't been acting professionally for long, he's signed on for "one role after another," including a supporting role in a new Netflix show, "Stranger Things," which he's filming on location, away from his family, now -- and notably, the voice of Charlie Brown in an upcoming "Peanuts" movie. "I didn't know much about the 'Peanuts' gang and 'Peanuts,' " he admitted. "But then, when I started working on it, my parents told me a little bit about it, and I did a little research on Charlie Brown, and now I actually have a book in my bedroom of the Peanuts comic strips on every Sunday from 1952 to 1956. Sometimes I like to read it. I'm really into Charlie Brown now." "Charlie Brown is my favorite character because he's the character I play, and he's so unique because he never gives up. Most people in life, when they're frustrated, they just give up." It seems like the budding actor is going down the right path, but for now, his dad has one major concern about having a child star. "He and I both know we're very fortunate — this could always end tomorrow, but we're very fortunate, he's working hard and we're doing what we can to keep it going," he said. "My biggest concern -- and my son is laughing right now -- is his schoolwork, and I'm on top of him day and night making sure we're not falling behind and maintaining good grades."